I think I have food ADD. Is there such a thing? Well if there is, then I’ve got it! if it’s just sweet, just salty, just sour… then after about 2 or 3 bites, I am bored. I don’t want to eat it anymore. I blame my mother for this! She used to serve all our meals with grapes or cantaloupe “to break up the taste”. She rationalised that by having a few bites of something sweet between mouthfuls of dinner it would encourage you to eat more. Is that weird? Who would have thought something so simple would shape my entire approach to food… FOR THE REST OF MY LIFE! Black forest cake and pavlova are my absolute favourite! I need those plump tart cherries to cut through the chocolate cake and the sour passionfruit, strawberries and kiwi to compliment that sweet meringue. The balance of sweet and sour is what makes it exciting. The food comes alive for me. I love to dip salty pretzels in nutella (especially late at night as I’m watching TV!) and as my husband looks on at me shaking his head. But I don’t care. I am in taste heaven! Which brings me to this week’s Tuesdays with Dorie recipe. 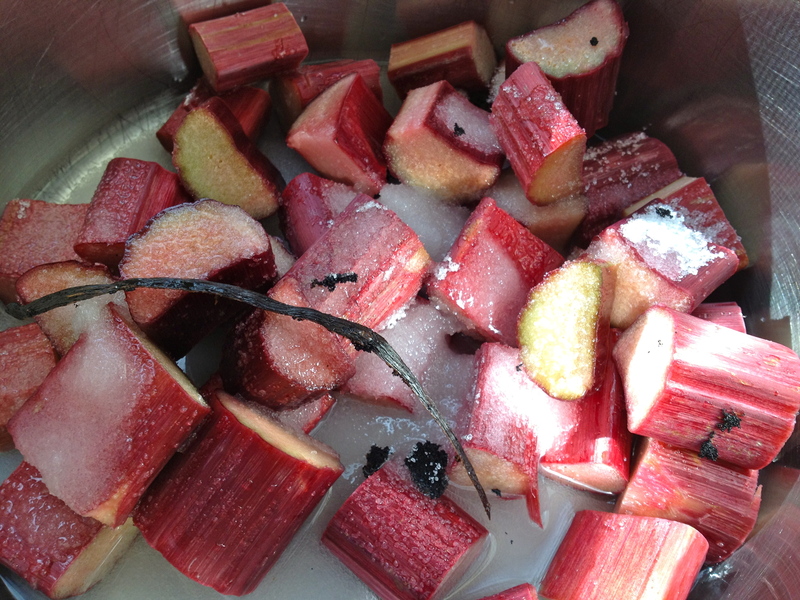 I combined the rhubarb with the sugar, vanilla bean and water to make the jam filling. And the hit of sourness that greeted me amongst the sugary sweetness of the jam excited me! This was going to be good! I made the dough. Chilled it in the freezer. Then grated half of it into the pan. (I’ve never, ever grated dough before!) I then spread every last drop of the rhubarb jam over the grated dough before grating the other half of the dough over the layer of jam. I baked it for 40 minutes and then sprinkled a generous amount of icing sugar over the top. I have to admit I couldn’t wait for it to get cold before I dove into it! My daughter (who has inherited my eating habits) loved this as much as I did. The smooth, tart, rhubarb jam cut nicely through the sweet shortbread. My husband, who has tamer taste preferences when it comes to his food, loved the shortbread but found the rhubarb jam a bit too sour for his liking. He fixed this easily by scraping off half the jam before going back for more, again and again! To get the full recipe head on over to this week’s hosts, Cher from The not so exciting adventures of a dabbler… or visit Lynette at 1smallkitchen . You can also visit Tuesdays with Dorie and check out what the rest of the group thought! Tags: baking, cakes, cooking, food, jam, recipes, rhubarb, shortbread, Tuesdays with Dorie | Permalink. Your mother´s fruit additions are a funny but very logical thing! It´s necessary to balance the sweet with something different. I like your pictures. Your shortbread looks tender and inviting! These look lovely – especially with the fruit filling oozing out. One of my favorite food combinations is salty french fries dipped in a chocolate milkshake. My poor daughters have picked up the habit as well. I love the contrast of opposite flavors. I think we have food add here too. Most of the FFwD recipes are too bland for us…we regularly make seasoning additions or put in more veges, etc…and I usually “fix” these recipes too. After readig other posts, I’m getting more ideas about how to make this recipe more flavorful. This shortbread recipe is really good, but I needed ice cream and more jam on top and almost got out the chocolate and caramel…part of why we all like to cook. No body does it as well as we do ourselves. My husband is the one who introduced me to the whole sweet/savory thing, so now if I eat something sweet I have to chase it with something salty or savory. Your rhubarb jam looks fabulous. Your shortbread turned out beautifully, Sanya. OMG, your shortbread turned out fantastic. Yum! I like hearing about your food history and your pictures are lovely!! My fave is McD’s fries with a hot fudge sundae 🙂 Beautiful picture – I think yours is the first rhubarb shortbread so far! Such a very pretty shortbread! Lovely photos! We really loved this….way too much! 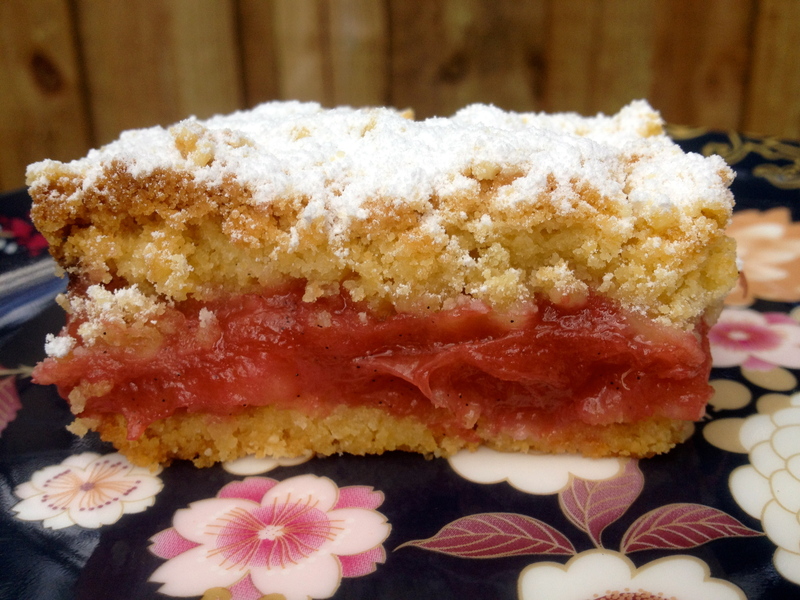 I’ll have to try this with rhubarb, it looks fantastic even if your husband only enjoyed the shortbread and not the jam!!! YUM YUM YUM. Excellent shot! Like the thick layer of jam. I made Strawberry Jam instead. Will definitely try the Rhubarb Jam. I think I have the same disease – my favorite foods to eat are sushi and Thai because I feel like there are so many layers of flavor that I never get bored. Your jam was such a beautiful color! I feel like mine didn’t get that beautiful pink/red that yours did. Glad you and your family enjoyed the shortbread! Now that is what I call “jam filled”! Beautiul! If the shortbread was half as good as the photo then it was outstanding. 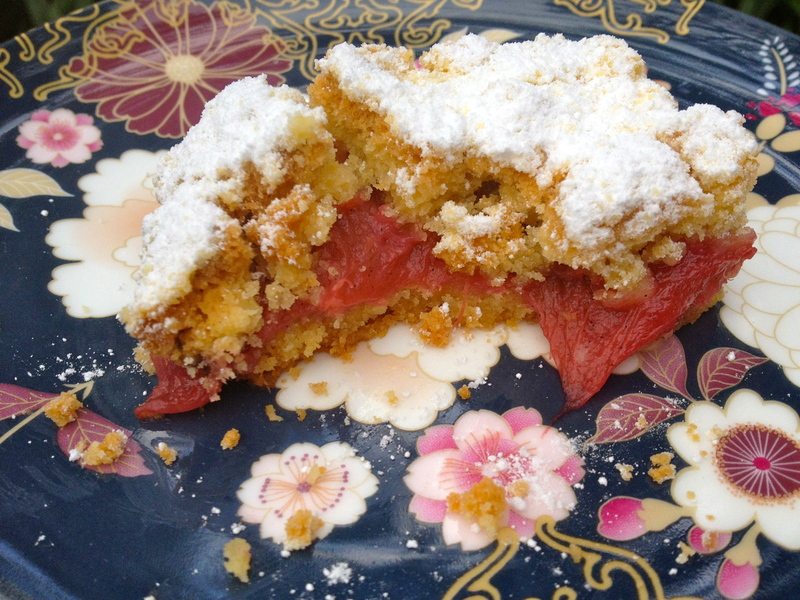 I agree with you – the contrast between the tartness of the rhubarb and the sweetness of the shortbread is what makes this so good. Yours looks lovely!